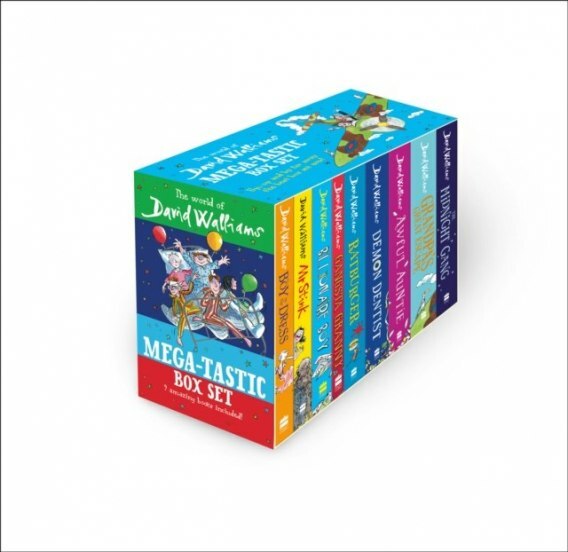 NINE hilarious and moving novels from bestselling, critically acclaimed author, David Walliams, in one box-set! THE MIDNIGHT GANG:When Tom gets hit on the head by a cricket ball, he finds himself at Lord Funt Hospital, and is greeted by a terrifying-looking porter. Things go from bad to worse when he meets the wicked matron in charge of the children's ward...But Tom is about to embark on the journey of a lifetime! GRANDPA'S GREAT ESCAPE:Many years ago Grandpa was a World War II flying ace. But when he is sent to old-folk's home Twilight Towers - run by sinister Matron Swine - it's up to Grandpa and his grandson, Jack, to plot a daring escape. Little do they know the wicked matron is on to them... AWFUL AUNTIE:Stella Saxby is the sole heir to Saxby Hall. But awful Aunt Alberta and her giant owl will stop at nothing to get it from her. Luckily, Stella has a secret - and slightly spooky - weapon up her sleeve... DEMON DENTIST:Strange things were happening in the dead of night. When children put a tooth under their pillow for the tooth fairy, they would wake to find something creepy in its place. Evil was at work. But who or what was behind it? RATBURGER:Can Zoe keep her beloved pet rat safe from the clutches of the dastardly Burt of Burt's Burgers? GANGSTA GRANNY:Ben's grandma is the boringest grandma ever: all she wants to do is to play Scrabble and eat cabbage soup. But there are two things Ben doesn't know about her: 1) She was once an international jewel thief. 2) All her life, she has been plotting to steal the crown jewels, and now she needs Ben's help... BILLIONAIRE BOY:Joe has a lot of reasons to be happy. About a billion of them, in fact. He has absolutely everything he could possibly want. But there's just one thing he really needs: a friend... MR STINK:Mr Stink stank. He also stunk. And if it was correct English to say he stinked, then he stinked as well... But there's more to this vagrant than meets the nose! THE BOY IN THE DRESS:Dennis was different.